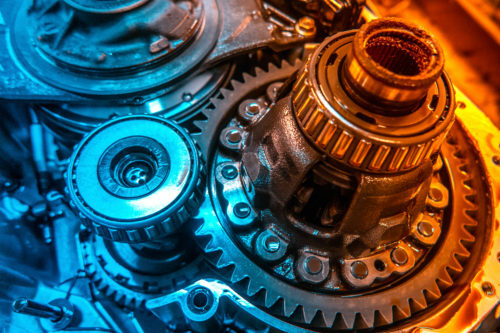 The transmission system is one of your car’s most crucial parts. It delivers the engine’s power to the drive axels to allow the engine itself to move at various speeds. As such, when an issue is found, transmission repairs become a necessity. This “bridge” between your car’s engine and wheels is made up of multiple gears and sensors, which ensure the engine’s energy gets to the tires without a hitch. You may not completely understand what the transmission system does, but you will feel when there is a problem. If it’s functioning well, the ride should be fairly smooth. If it’s having issues, you may hear grinding or feel something is off. Much of this goes back to the type of car you have. In a car with a manual transmission, the driver uses a clutch and shifter to manually change the gears, causing the RPMs (revolutions per minute) to increase. If it’s an automatic transmission, the system shifts through the gears on its own as the car accelerates or decelerates. In both cases, the transmission system helps control the amount of torque going back and forth between the engine and the wheels. Common issues range from loud grinding noises, gear slipping and difficulty or delays in shifting. Transmission fluid also plays a role. When your car has enough, the fluid keeps the transmission system cooler. As the level gets lower, the system is more susceptible to heat damage. You may feel the gears “slip” from one to another without any reason or change on your part. At the same time, the car won’t accelerate as fast or it seems like it suddenly lost power. You’ll also hear a higher pitch coming from the engine. Your car doesn’t change gears or it’s a rough shift from one to the next, accompanied by a loud thud or clunking sound. At the same time, your car struggles to reach the desired speed. You might also notice a delay whenever you shift, with a pause or revving sound before you can move the car. The check engine light comes on. While this sign isn’t always absolute, it could indicate that your car’s computer is generating an error code in regards to the transmission system. You feel the car shaking or notice it “jump” when you accelerate. There’s a burning smell coming from under the hood. You see fluid leaking under the car. When you check the fluid, it has a cloudy or thick appearance, accompanied by a foul smell. A key part of your transmission system, fluid helps control heat, lubricating and transmitting power. Leaks decrease and negatively impact these functions, leading to grinding between gears, less hydraulic pressure, overheating or total vehicle failure. In fact, leaks may be behind those slips and surges you feel. Why is your car leaking transmission fluid? Although there may be multiple sources, a damaged pan gasket or axle seal is frequently the cause. Even if your car isn’t leaking, it still may need a flush to fully replace the old fluid. Older fluid can also affect your system, leading to slipping and shifting issues. Although many people debate when a flush should be performed, it will likely be needed every 20,000 to 60,000 miles, depending on your car’s model and year. Related to your fluid, your transmission system’s solenoids assist with controlling its flow and are directly powered by your car’s transmission computer. When this part needs to be replaced, you’ll often have difficulty shifting or may find yourself over-shifting to compensate. Repairs: Generally for one part within the system, a technician repairs that component alone. It’s ideal if your system has not sustained significant damage. Rebuilds: A far costlier repair, this solution involves taking apart and inspecting the entire transmission system before any worn out, failing or damaged parts are replaced. Replacement: Also known as “re-manufacturing”, a new or refurbished transmission system replaces your current system. Generally, this is only recommended if the system as a whole is too damaged to be repaired or rebuilt. Afterwards, a technician updates the new transmission system to the pre-built factory setting. Have you been experiencing shifting difficulties or notice fluid leaking from your car? It might be a problem with the transmission system. To have your car inspected, make an appointment with DaSilva’s Auto Body today.